These instructions describe how to run the Wikipedia demo on a single node. 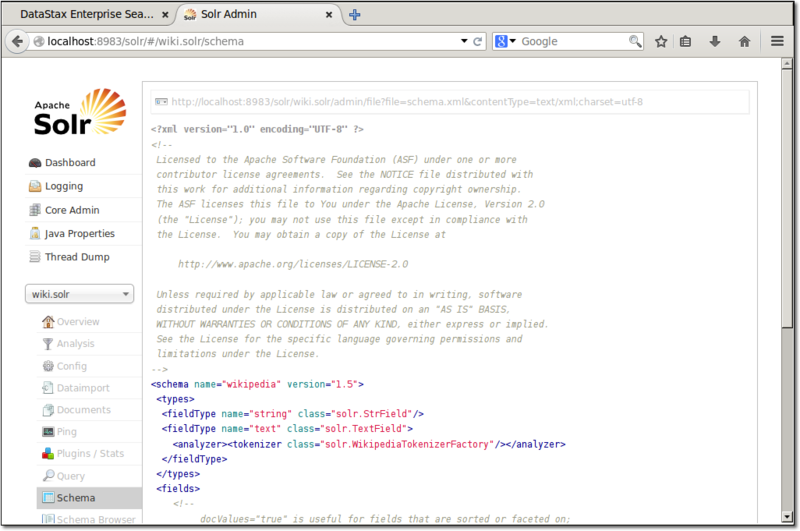 You run scripts that download 3,000 Wikipedia articles, create a CQL table, store the articles, and index the articles in Solr. The demo includes a web interface for querying the articles. You can also use the Solr HTTP API or CQL to query the articles. The scripts that you run in this demo are written to set up the localhost. The demo fails if the default interface of the node is not 127.0.0.1. Start DataStax Enterprise as a Solr node if you haven't already done so. Go to the wikipedia demo directory. The script also creates the Solr index and core. The wiki.solr part of the URL creates the keyspace (wiki) and the column family (solr) in Cassandra. Index the articles contained in the wikipedia-sample.bz2 file in the demo directory by running the index script. 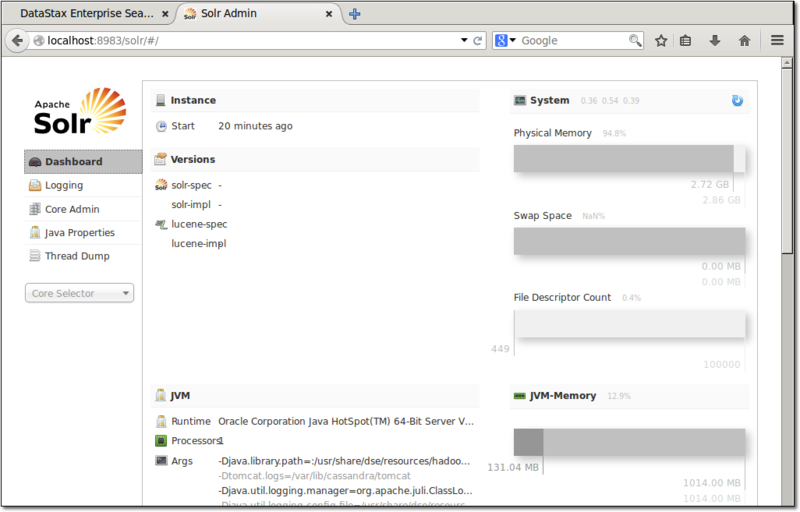 Open the Solr Admin tool. Be sure to enter the trailing "/". Inspect the schema. 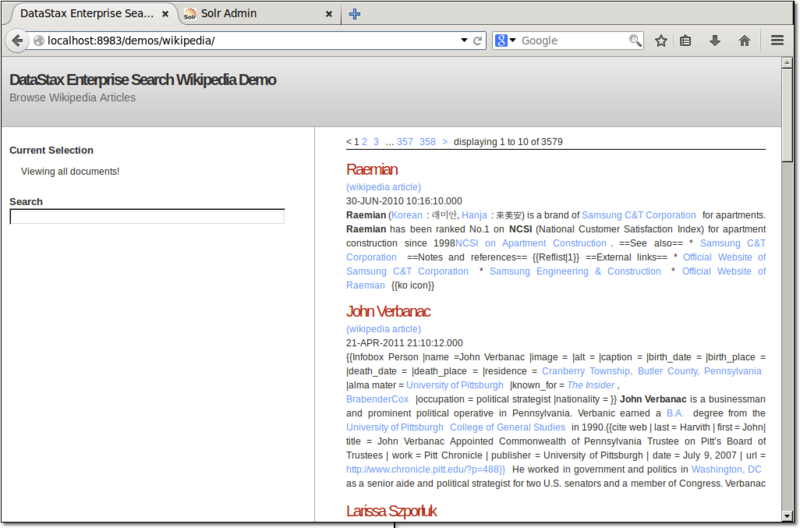 In the Solr Admin, select wiki.solr from the Core Selector drop-down. Click the Schema in the vertical navigation bar. You can use the Solr Admin to query the Wikipedia database in Cassandra. You can also use the Solr HTTP API or cqlsh to query the database. Wildcard search 'Ken?a' Use ? or * for single or multi-character searches. Fuzzy search 'Kenya~' Use with caution, many hits can occur. Phrase search '"American football player"' Searches for the phrase enclosed in double quotation marks. Proximity search '"football Bolivia"~10' Searches for football and Bolivia within 10 words of each other. Range searches 'title:[football TO soccer}' Supports both inclusive and exclusive bounds using square brackets and curly braces, respectively. Term boosting '"football"^4 "soccer"' By default, the boost factor is 1. Must be a positive number. Boolean operator '+Macedonian football' AND, +, OR, NOT and - can be used. Grouping '(football OR soccer) AND Carlos Aragonés' Use parentheses to group clauses. Field grouping 'title:(+football +"Bolivia")' Use parentheses to group multiple clauses into one field. To search in the bodies of the articles, enter a word in the Search field, and press Enter.